D Angel Krstev (Lethbridge, 1999-2000) exercised an out clause with Litoměřice (Czech Republic, 1. Liga) and signed a contract for the rest of this season with Neumarkt/Egna (Italy, Serie A). This season, he had eight assists in 22 games with Litoměřice 22 GP, 0+8. We lost Jean Beliveau on Tuesday night and the hockey world was quick to react right here. The Prince Albert Raiders have acquired F Colton Heffley, 20, from the Kelowna Rockets for a fourth-round selection in the 2016 bantam draft. Heffley, from Swift Current, has 83 points, including 23 goals, in 270 regular-season games, all with the Rockets. . . . This season, he has 10 points, three of them goals, in 27 games. . . . He was a second-round selection in the 2009 bantam draft. . . . The Raiders meet the Rockets in Kelowna on Saturday night. . . . The Prince George Cougars have placed G Jared Rathjen, 20, on waivers, a move that allows them to get down to the maximum of three 20-year-olds on their roster. . . . Rathjen, who is from Prince George, got into three games with the Cougars. He also has played with the Victoria Royals and Vancouver Giants, and started this season with the Medicine Hat Tigers. . . . The move leaves the Cougars with F Chance Braid, F Jari Erricson and F Zach Pochiro as their 20-year-old players. The Cougars had two weeks to get down to three after the NHL’s St. Louis Blues returned Pochiro, who had been with the ECHL’s Anchorage Aces. . . . They will continue to go with Ty Edmonds, 18, and Tavin Grant, 16, as their goaltenders. . . . The Vancouver Giants have dropped F Brendan Holterhus, 17, from their roster. 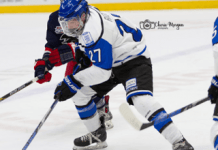 He is expected to join the AJHL’s Spruce Grove Saints. A native of Edmonton, he was pointless in 16 games with the Giants. In Red Deer, F Connor Rankin scored three goals and added three assists to lead the Calgary Hitmen to a 9-5 victory over the Rebels. . . . Rankin’s third goal, and his 11th of the season, was the 100th of his career. 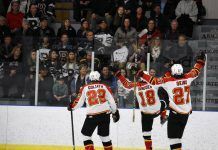 He enjoyed his first hat trick with Calgary and the third of his career. . . . The Hitmen led this one 5-0 after the first period. . . . The Rebels got to within 6-4 and 7-5 but that was it. . . . Calgary F Beck Malenstyn scored twice, giving him four goals this season, while F Chase Lang scored his 12th goal and added two assists. . . . F Riley Sheen, who was acquired Monday from the Lethbridge Hurricanes on Monday, had two goals and an assist for Red Deer. He’s got five goals this season. . . . In Victoria, the Portland Winterhawks jumped out to a 3-0 lead and hung on to beat the Royals, 6-4. . . . The Royals, who trailed 4-1 after the first period, tied it 4-4 on F Brandon Magee’s ninth goal at 8:31 of the third period. . . . Portland F Oliver Bjorkstrand scored his 100th regular-season goal, shorthanded, to give his side a 5-4 lead at 10:25. . . . Portland F Nic Petan added insurance with an empty-netter at 19:54. He has 300 career points, including 199 assists. . . . Bjorkstrand, who has 19 goals this season, has goals in five straight games. . . . Portland F Chase De Leo scored his 16th goal. . . . Victoria D Travis Brown scored twice, giving him 12 goals this season. . . . The Winterhawks have won six in a row. . . . In Kamloops, the Blazers erased a 3-0 first-period deficit and beat the Saskatoon Blades, 4-3. . . . F Cameron Hebig gave the visitors a 3-0 lead with a PP goal at 18:56 of the first. . . . The Blades took a 3-1 lead into the third period. . . . F Matt Revel, whom the Blazers acquired from the Blades last season, scored his eighth goal at 13:38. . . . Kamloops won it with two goals in the game’s final minute. D Michael Fora got his third goal at 19:23 and Revel got the winner at 19:40. . . . The equalizer banked off two Saskatoon players, hitting a shin and a head on the way into the goal. . . . F Matt Needham and F Cole Ully each had two assists for Kamloops. . . . D Adam Henry had two assists for Saskatoon. . . . Saskatoon G Nik Amundrud stopped 45 shots. G Trevor Martin was to have started, but couldn’t go because of the flu. . . . The Blades scratched F Sam McKechnie and D Amil Krupic with the flu. . . . Daniel Nugent-Bowman of the Saskatoon StarPhoenix is on the road with the Blades. His game story is right here.